With bonfire night over, we’ve already seen the shelves heaving with advent calendars, and we might have shed a tear at the John Lewis advert too. The countdown to Christmas is upon us, and it’s time to talk Turkey. At field&flower we’re proud to be great friends with our free-range poultry farmer Stu, and we regularly visit the farm in the lead up to Christmas so we can share the journey of our Christmas turkeys with you. Christmas is on Stu’s mind from February. This is when he puts in his bronze turkey order at the hatchery. His focus is on quality not quantity, thus Stu keeps his orders restricted to a small number so there is less stress on the birds. Stu chooses to farm this particular breed as they are naturally slow growing, and ultimately produce a better flavour. He rears his turkeys to full maturity, leading an active life for over 28 weeks, double the lifespan of supermarket birds. In order to guarantee a truly free range turkey, Stu allows them to roam in endless space for their entire lives. They’re fed on a diet of homegrown cereals to ensure they thrive and grow to a healthy weight. When the time comes to process the turkeys in early December, they are walked by Stu to the abbatoir on his farm. This creates zero food miles and prevents further stress for the birds. The turkeys are hung for two weeks which created optimum flavour and tenderness. Then, before you know it, we carefully pack the turkeys and deliver them straight to your door ready for your Christmas dinner. For these reasons we pay Stu 40 percent more than he would if he sold his flock to mass producing retailers. 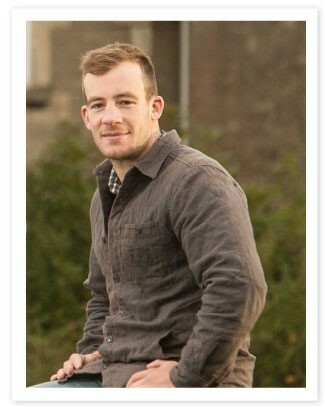 This then allows him to invest more in his farm and continue to specialise in breeding high-welfare birds. 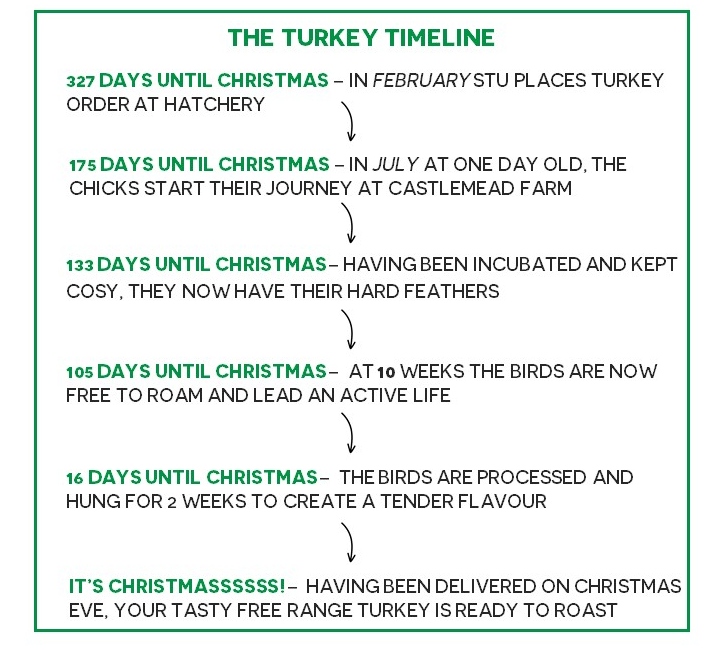 We feel so proud that we are able to not only offer a product of the highest quality but can also share a story behind your Christmas turkey too. Don’t forget you can order your Christmas turkey with us now! We’re doing crowns, breasts and whole turkeys. 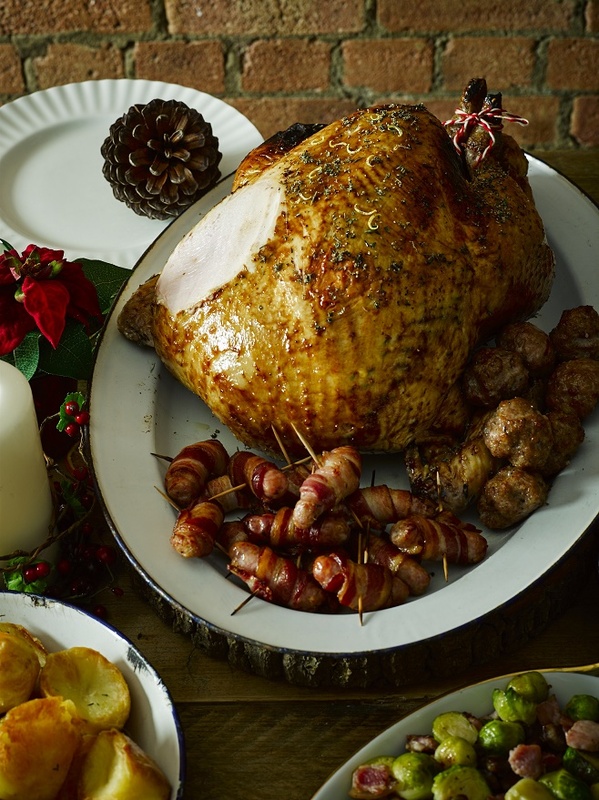 Whether you’re feeding a few, or a big family we’ve got Christmas dinner sorted. We deliver on Christmas eve too! 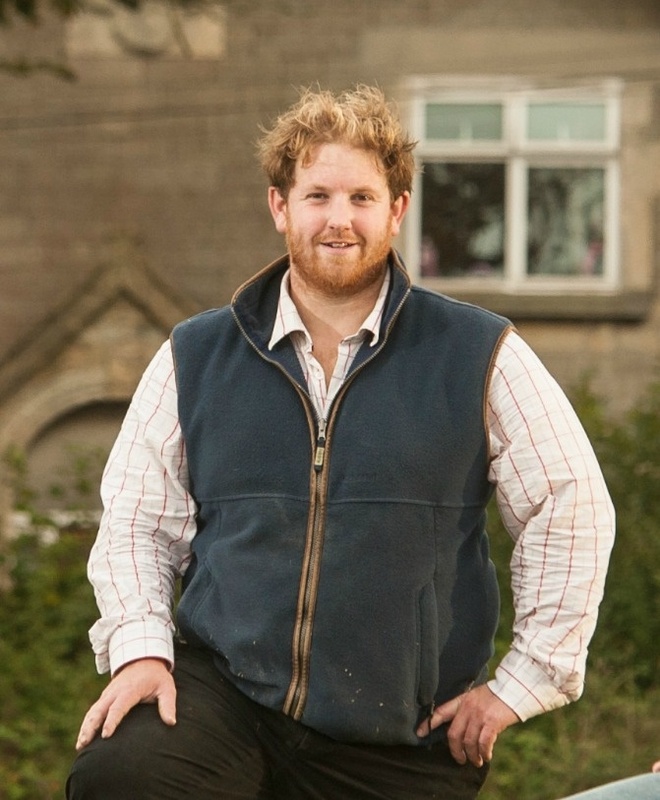 These days our team is pretty busy at the butchery so it’s rare (sorry, we couldn’t help it) that we get to ask our co-founder and beef farmer James Flower, lots of questions. We were itching to find out a little more about why he’s personally selected all 17 cuts of steak on our site and for him to share his excitement about our new sharing steaks. What’s your favourite cut of steak? It’s a tough call between sirloin steak and rump, but I’d have to say rump. It has great flavour. What’s your favourite way to cook a steak? People often ask me how to cook steak. It definitely depends on the cut. For a fillet, it has to be rare. If I’m having rump or sirloin steak, it has to be medium rare. A rib eye steak is best cooked medium so it’s marbled fat can melt and flavour the meat. I like to keep it simple. I recommend you lightly oil and season the meat. Then whack on a searing hot pan and cook to your taste. We have a ‘how to cook steak guide’ on our site which is great. Why should people buy their beef from field&flower as opposed to competitors? All of our beef is sired by Traditional breeds such as Aberdeen Angus, Hereford and Ruby Red Devon. These breeds are slower growing and are proven to produce beef with better flavour. We source all of our beef from grass based farms in the South West (the best part of the UK for naturally grazing cattle) including our own farm. Cattle that have had a grass and forage based diet for the majority of their lives are happier and healthier and in turn produce beef that is tastier and better for us. Combined with great animal husbandry the combination of these factors mean we can produce a product that Supermarkets and other retailers can’t. We traditionally dry age our beef and have a full maturation period of at least 28 days. This increases the depth of flavour and tenderness whilst decreasing the water content allowing for a superb eating experience. Why have you created an alternative steak box? We have great butchers and deal with whole cuts of beef from nose to tail – so the alternative steak box is a great way for us to showcase some cuts that you may not have tried before and can’t get from a supermarket. We invest so much time in producing quality beef, we want people to try every steak there is to offer. We’ve got 4 new cuts in there plus great steak recipes, sauces, and how to cook steak guides on the website. What’s your favourite steak recipe? If I’m honest I don’t like to mess around with a steak too much – it’s too good to add anything to it. Great steak for me should be griddled and served with chunky chips and a very simple sauce. What’s this rumour about sharing steaks? T bone steak) in our shop. This consists of both the fillet and the sirloin separated by a T bone right down the middle. Two steaks, in one. We also have a bone in prime rib, a sharing rump steak and a sharing sirloin steak too. They feed 2-4 people depending on the cut, or 1 person if they’re feeling really hungry. We’ve created a one off box for them all too.